Learn About Cimabue in Art History, View His Art and Famous Paintings. Cimabue, 1240-1302, was one of the first famous artists in art history to begin to break away from the strict, flat rigid, frontal, and very ornamental color style of Byzantine art, in one of his famous altar panel paintings "Madonna Enthroned", 1280-90. The Madonna central figure introduces the Christ child while some of the prophets below read their prophesies from scrolls. Christ himself holds a scroll from which he is teaching the faithful believers. 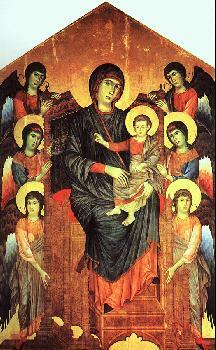 Cimabue’s colors have darkened over time. Mary’s blue ultramarine mantle has muddied as this particular color does with time. Ultramarine was used for Madonna’s, as it was the most expensive and valuable color of this art period. Ultramarine at this time was even more valuable than gold. His famous paintings introduced a more life-like treatment of traditional subjects. His figures were more realistic, volumetric, and he even attempted to model their faces. The draperies worn by the figures in his paintings were much more naturalistic, softer, and life-like, than artwork done in painting history prior to this point. His artwork still maintained a linear quality however. Cimabue did not outline forms and figures as the Byzantine artists had done in art history up to this point, but he was still ornamental in his art seen in the many gold lines in the Madonna’s clothing. He specifically made sure his picture plane was not a repetition of pattern and ornamentation as Byzantine artists had done. His figures in his early paintings were flat, stacked on top of each other, with no perception of volume, therefore the figures did not appear occupying a position in space. A typical flat gold background instead of a receding composition didn't help volumetric perception either. His figures did not have a great deal of body or facial expression and did not interact with each other. Another one of Cenni di Peppi’s famous paintings in art history Crusifixion, was painted in 1279. Due to the oxidation of his whites it is difficult to understand the iconography. Cimabue seems to be capturing a moment in time when Jesus Christ has just died. A great wind and earthquake has come up blowing everyone’s clothing. An angel nearby according to the thinking of the time collects the blood of Christ foretelling the sacraments of the Eucharist. Other famous artists of the Gothic art period are Giotto and Simone Martini. To view Cimabue, oil painting reproductions, click here.